My actual reaction to finishing this book. I finished it on the day Christine Blasey Ford testified against Kavanaugh on my lunch break. I could hear it blaring from the kitchen because my boss was watching the Fox News coverage. (Bleh, I know.) And I was sitting in my cubicle, stunned by this and near tears. It was just so damn good. At its heart, it’s a revenge story. Sadie has lost everything. Her absent mother. Her sister that she basically raised. Her childhood. And now she’s going to take something back through revenge. Because, she knows who murdered her sister. And, he had hurt her, too. The story is told in alternating chapters. One of Sadie going through all of this to find the man. The other in a podcast format of telling the story about trying to find her and what’s going on. I think Sadie’s side worked the best. I love podcasts, as you all know from my reviews of them, but reading a transcript wasn’t the same. It would have been best as an audiobook, honestly. But I liked seeing the other perspectives on what was going on and the revelations as they came in the podcast. 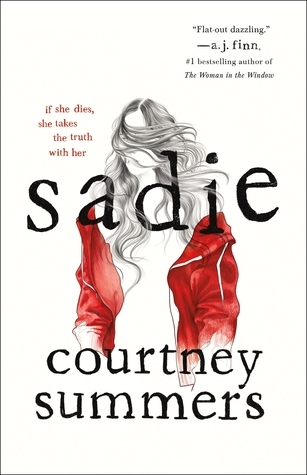 But, I far preferred reading Sadie’s perspective. Also, I think the story got lost in the middle on some of the detours. It was a tightly woven story and everything came together in the end, but I still think it got lost in the details that didn’t have a payout until the last few pages. The ending was solid. I don’t think there could have been one better than that, but I seriously want another chapter. Just one more so I can find out how it turned out. Overall, this is definitely going to be a book that I want to own and reread one day now that I know the whole story. Do you have a favorite revenge story? It was! I was so happy that it actually lived up to it. That rarely happens for me. Same for me. I was really pleasantly surprised with this one. Glad you were too! !